No Bake Macaroons. These things are like crack. You cannot just have one! I know I said that about the Coconut Cream Larabars too. If you like those, then you will love these! Did I mention that these were no bake? That’s right. These yummy little treats can be made in just a few minutes. 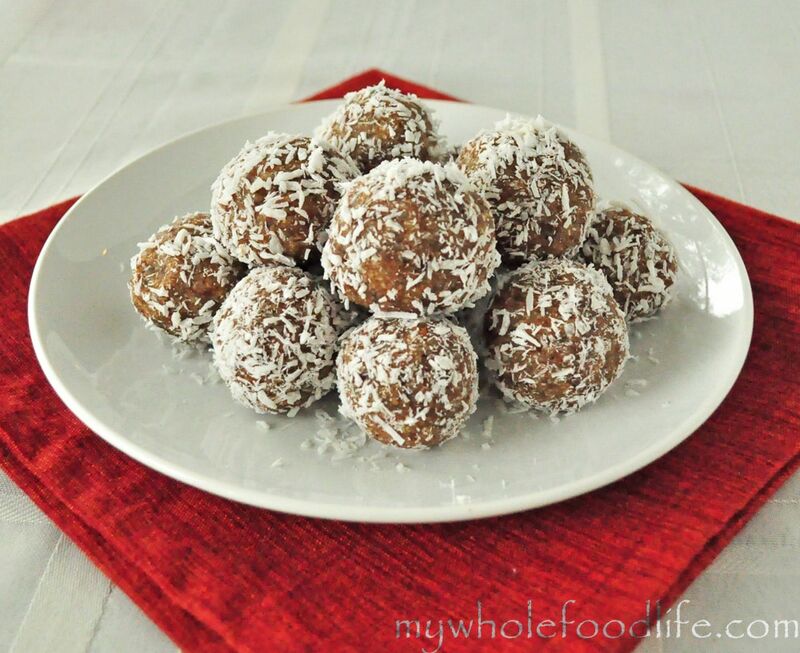 These are also vegan, gluten free and paleo. These freeze well too, so feel free to make a big batch and freeze some. So any time you get a craving for macaroons, there they are in the freezer! Sounds like a plan to me. Combine the flax meal and warm water in a bowl. Whisk it and throw it in the fridge. In a food processor, pulse the coconut and almonds into a fine powder. Then add the dates, flax mixture, vanilla and coconut oil. Pulse until the mixture starts to come together. You can also roll the balls in some more coconut like you see I did in the photos. I got about 12 out of my batch. Enjoy! How many dates should we use if we omit the maple syrup?? My guess is about 10.
where is the maple syrup in this recipe? It's not in these anymore. I changed the recipe a few weeks after it was originally posted. Just made these! I only had one cup of coconut so I used 1 cup oats as well. They still turned out great! Super yummy! :) Thanks for of your great recipes! How many calories are they? I just did a rough calculation and they came out to 103 calories per ball. Um, I didn't see anything about maple syrup....is that a substitute for the dates? I revised the recipe since it was originally posted. I read the post 5 times and I saw nothing about maple syrup in the post. Did you read that in the comments? You can use maple syrup in place of the dates if you like. I used maple syrup in the original recipe, but I think these came out better with the dates. The comment i have included mentioned maple syrup and I kept looking at your recipe and never saw any mention of it, lol. I like the date recipe best. Natalie on April 23, 2013 at 10:30 am said: How many dates should we use if we omit the maple syrup?? Reply ↓ mgking76 on April 23, 2013 at 10:33 am said: My guess is about 10. These look so yummy!! I have flax seed, could I use that in place of flax meal? Yes, but I would grind it up first. Our bodies cannot digest flax seed. Just made these and they were so delicious!! I love how easy your recipes are and I like that they are almost completely guilt free! Thank you. I would use maybe 15? Is there something I can sub for the flax meal. I don't have any but I want to make these. Any other thoughts ~ oatmeal maybe? I used the flax meal to make an "egg." Chia seeds work well with that too. I am not sure how oats would work, but you can try? I wonder if the measurements would be the same using coconut flour and almond flour as opposed to grinding it yourself? Or do they need to have more texture than the flours. I have so much flour, in the freezer, I need to use up some inventory! Thanks! I'm not sure. You can try it and see. I finally just made these. I needed to get the flax meal and finally did. They are in the refrigerator now - I had a little trouble getting the mixture to come together - like it needed more liquid - my beautiful MedJool dates were quite large so maybe that was the problem. 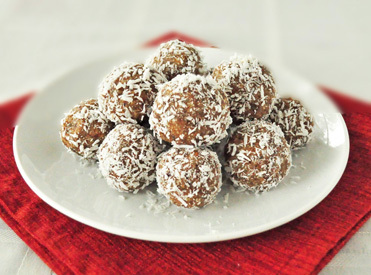 BUT, I worked the mixture together and made the balls - rolled them in more coconut as you suggested. I had to sample one - duh - absolutely fantastic! Very easy and super yummy. Thanks for this great recipe. Can you use a vita mix? My food processor just died. She gave me a good run - I had her 27 years (kenmoor). Do you recommend a brand? I have chopped dates. How much would I use? Also, I like the taste of maple syrup better than dates. How much did the original recipe call for? Just curious why you changed from the syrup to the dates. Was it a texture thing? They held together much better with the dates. They were also much softer. If you use chopped dates, I am guessing about 1 cup? Thankyou so much for this recipe. Made it for my grandchildren who absolutely loved them. They were a big hit with adults & children alike. You are so welcome Jules! I have all the ingredients to make these except for the ground vanilla beans. Can I grind my own? If I can, would you grind the bean too? Or do you just take out the inside? I buy mine ground on Amazon. You can also slice open a vanilla bean and scrape the seeds in.